About a year and a half ago, I found myself with an open spot during Parent-teacher conferences and decided to pass the time by starting to read William Shakespeare’s Star Wars by Ian Doescher. Being a 6th grade Language Arts teacher and a lifelong fan of STAR WARS, I was immediately drawn to the subject matter and form of the book when it was announced, and after hearing Ian interviewed on COFFEE WITH KENOBI, I decided to purchase a copy for my classroom. As I began to dive into the book, I was immediately struck by how funny it was. I found myself reading it out loud quietly to myself in order to fully appreciate the language and consequently found myself quietly laughing out loud. On a whim, I decided to send a tweet to Ian Doescher to let him know how much I was enjoying the book and how much fun it would be to share with my students. Much to my surprise, he responded quickly and we struck up a brief but very entertaining conversation, and at the conclusion, he offered to speak my students about his book. As a proud member (Rogue 3) of “Star Wars in the Classroom,” I was very excited to incorporate this activity into my lesson plans. And as Ian was also a member (Gold Leader), the potential synergy was too much to resist. We corresponded over the next several weeks and finally settled on a date and time. Much to my surprise and delight, Ian made himself available to speak to all 3 of my classes! Through the use of FaceTime and an Apple TV, Ian shared a presentation from 200 miles away that captivated the students and was both entertaining and educational. He read excerpts from his book (only the first one was out at the time) and from a few Shakespearean plays and sonnets in order to show the parallels. He then answered questions from the students regarding not only his books but writing in general. It was a wonderful experience for the students, and apparently Ian had a great time too as he followed up with me by suggesting that we do the presentation in person the following year. So this past August, I began working with my administrators to make Ian’s visit a reality. Because the school at which I teach is in southern Washington state and Ian lives in Portland, Oregon, the travel would not be much of an issue. I negotiated the proper protocols and garnered support from my fellow Language Arts teachers in order to build anticipation among the students. As virtually every 7th grader in our school had experienced an Ian Doescher presentation the previous year, this was a fairly easy task. Finally on January 30, 2015, Ian Doescher came to Housel Middle School in order to present his books in the context of a whole-school assembly. My wife was able to attend and also brought our two children to the event. Like me, they were all very excited to have an opportunity to meet Ian and get to hear his presentation. To kick things off, five of my current students presented a reading of short scene from William Shakespeare’s Star Wars. Initially, they were a little nervous to perform in front of a crowd of 700 and a couple of local newspaper reporters, but they pulled it off brilliantly. As the students completed the scene and were applauded for their efforts, I introduced our special guest and Ian Doescher stepped up to the podium. After beginning with a brief explanation of his process, Ian launched into the prologue of his first book and recited the text with clarity and confidence. From there, the New York Times bestselling author read various excerpts from his three published books as well as corresponding works by William Shakespeare to illustrate the books’ genius and humor. Applause from the audience followed each reading and I could tell the students and staff were enjoying themselves. As the event continued, Ian incorporated several surprises including reading in the voices of both Obi-Wan Kenobi and Yoda (who speaks in haiku in Ian’s books). But the highlight for me was the singing of the “Elizabethan gangsta rap” from THE JEDI DOTH RETURN. Confidently singing his hilarious lyrics to music written by Robert Lopez (a college friend and co-writer of the songs in FROZEN), Ian Doescher brought the house down with his performance. A bit later on, the Ian revealed that he has been working on Shakespeare adaptations of the Prequel Trilogy films and that the books are all due this year (the first of these new books, THE PHANTOM OF MENACE, is available April 7). To help introduce the new material, Ian brought a student down from the audience to read a scene with him from the second Prequel book (tentatively titled William Shakespeare’s The Clone Army Attacketh). A conversation between two Jedi who discuss the probability of their adventures being told to generations to come, the scene was brilliantly self-referential for the book’s characters and hilariously self-deprecating for the author. It was meta (on many levels) at its finest. Finally, Ian answered several prepared questions from the students that ranged in subject matter from his process in writing the books to how being a successful author has changed his life. Each question received a thoughtful answer from the author, and the audience gave a rousing response each time their fellow student was credited with asking a question. As the presentation drew to a close, the students were dismissed back to their classes, but many stayed behind to talk to Ian and ask for autographs. Through it all, Ian was gracious and very generous with his time–waiting until the last scrap of paper had been signed and the last student had gone home. Many of my students have since expressed their excitement and joy at having shared in the experience. The assembly was a big success and chronicled favorably by the local newspapers. For me, Ian Doescher’s visit was the culmination of an incredible process of facilitating a large school-wide event and sharing one of my passions with my family, my students, and my co-workers. It was my absolute pleasure to bring STAR WARS into the classroom, and thanks to this experience, I am now honored to call Ian Doescher my friend. 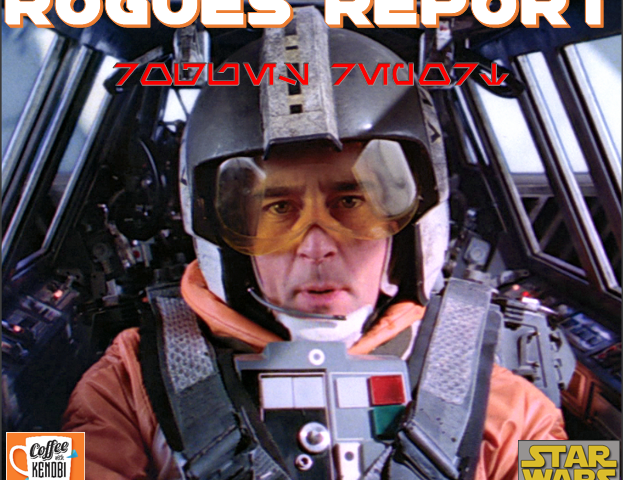 And please check out the great work being done at STAR WARS in the CLASSROOM, and if you’re an educator, consider joining the ROGUES!